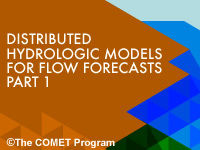 Distributed Hydrologic Models for Flow Forecasts – Part 1 provides a basic description of distributed hydrologic models and how they work. This module is the first in a two-part series focused on the science of distributed models and their applicability in different situations. Presented by Dr. Dennis Johnson, the module begins with a review of hydrologic models, and then examines the differences between lumped and distributed models. It explains how lumped models may be distributed by subdividing the basin and suggests when distributed hydrologic models are most appropriate. Other topics covered include the advantages of physically-based versus conceptual approaches and some strengths and challenges associated with distributed modeling. It would be better if there are more examples. Most are the things verbally explained by Dr Johnson, and they are not written on the slide, so one needs to focus completely on his pronunciation in order to catch everything. However, the course and lessons are so meaningfully designed. This lesson is very useful my department. Nice introduction of hydrologic model. it is a good lesson to improve our knowledge in this field. Thank you so much for providing such an excellent platform where one can avail outstanding knowledge and could improve his/her skill and techniques.The lesson was quite helpful in improving my knowledge about distributed hydro-logical models. Sir Greetings! voice is not clear in some portions,so time demanding.otherwise excellent presentation. This lesson was very informative but challenging for me. However, I was very successful in completing it. I feel , the session with the audio was just fascinating and was easy to understand and easy to remember.As if I was taking a Classroom session.